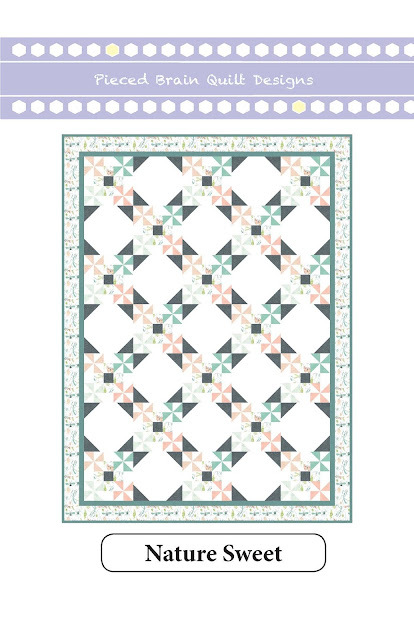 - The quilt measures 59" x 79"
- The blocks finish at 10"
- There are 35 blocks. The half-square triangles for the pinwheels are made using the Strip Tube Ruler, a fantastic tool for quickly making HSTs (This is my preferred method of making HSTs; I make no money as I mention the ruler on this blog or use it on my patterns). 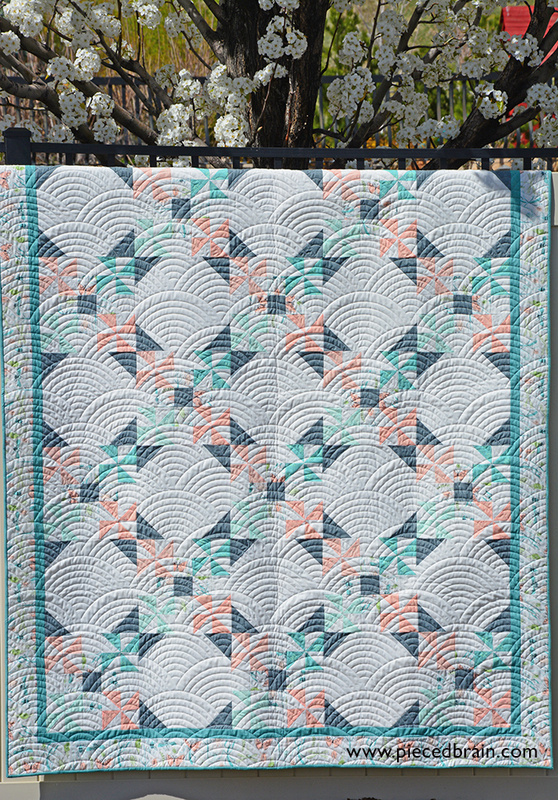 The downloadable PDF features step-by-step photographs of the block assembly process, and is available now from my shop Quilterly on Etsy. For the this sample I chose Timeless Treasures' fabrics from the beautiful, cheerful, and colorful collection called Perch designed by Rae Ritchie. 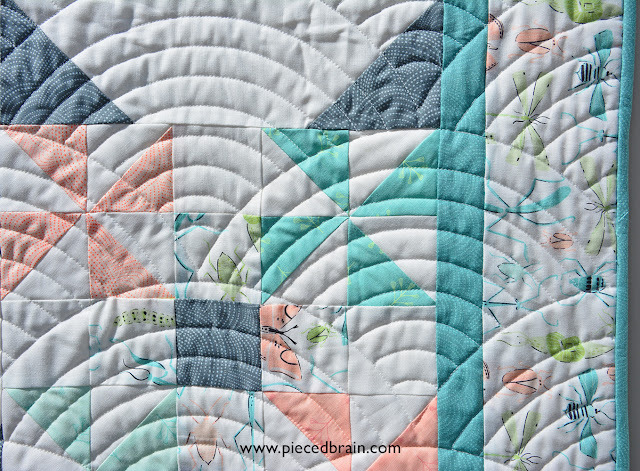 The peach, teal, lime, and gray palette is perfect for modern quilt designs! 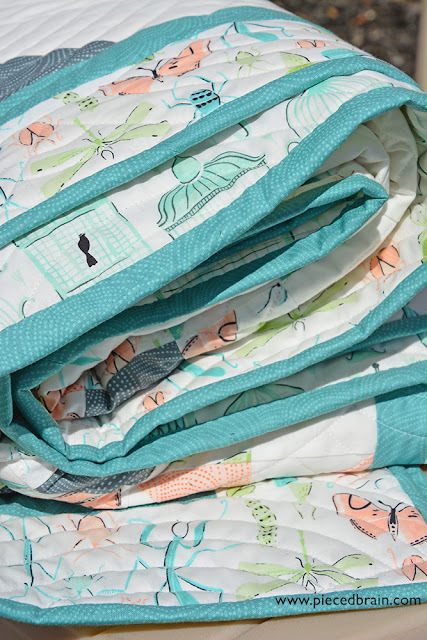 As I was stitching the quilt I remembered when I would take my first boy out on walks: he would want to grab every bug he saw on the way but I was so squeamish! I grew up with a sister and bugs were the last thing on our list of things to touch. I learned fast as a young mother to find beauty in (and touch) bugs! The blocks were pieced using Aurifil 50 wt thread. 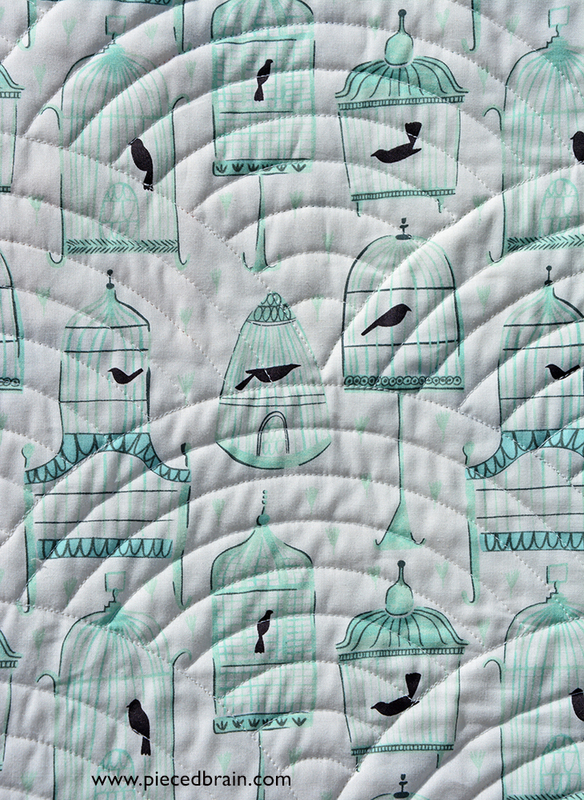 Melissa from Sew Shabby Quilting matched the quilting motif to the print on the gray and teal fabrics. I love it! This is a gorgeous pattern and gorgeous fabric! Denise this turned out beautifully. I love it, and the fabric! It is beautiful. Congratulations on a great finish! Well done! It is really lovely!